Color Club Cloud Nine | Light Your Nails! While eagerly waiting for swatches of the 2015 Halo Hues shades I decided to paint my nails with one of the older releases. 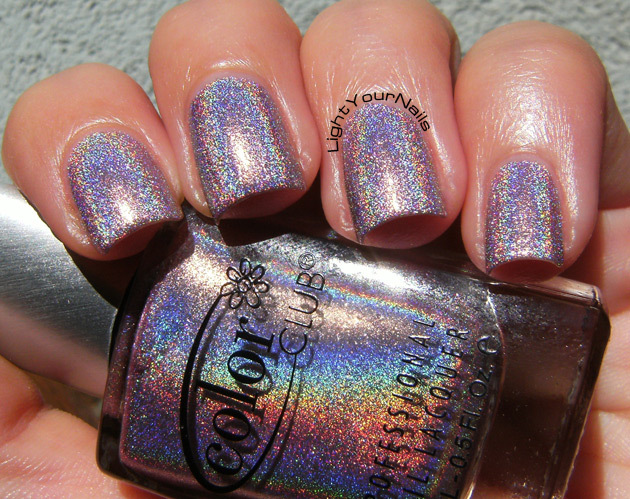 This beauty you probably all know is Color Club Cloud Nine from the 2012 Halo Hues collection. It’s a pink holo with a very strong linear flame to it. It needs no special base coat despite how strong it is, which is something great about Color Club holos! Shown are two easy coats, no top coat. In attesa di vedere qualche swatch dei nuovi Color Club Halo Hues 2015 ho deciso di sfoggiarne uno più vecchio. Cloud Nine fa parte della collezione Halo Hues 2012, ovvero la prima. E’ uno smalto olografico rosa con effetto lineare decisamente spiccato. Non ha bisogno di basi particolari nonostante sia così pUtente, che è una caratteristica positiva dei Color Club Halo Hues. I couldn’t resist a macro show! Do you like it? Or should I say do you own it? Or maybe you have another favourite Halo Hue, tell me which one then! Vi piace? O magari vi dovrei chiedere se ce l’avete anche voi? O magari è un altro colore il vostro preferito tra i Color Club Halo Hues, e in quel caso ditemi quale! waaa è bellissimo, perchè non l'ho preso quando si trovava?!?!?! Non si trova più? o_O Al Cosmoprof l'avevano. ç__ç <- basta per far capire il mio stato emotivo di fronte a questa meraviglia? Forse dovrei inserire una categoria a parte per i CC nel mio "prontuario", sono troppo stratosferici!!! In effetti han ben pochi rivali. It is gorgeous! Those Color Club halo hues are a must-have! I love the strong shine and holo they give you without requiring a special base. These are the easiest polishes I have to use. They go on so willingly and evenly, like warm butter! Thank you for showing us this. It is nice to see one showcased on its own, without gradients or stamping. Thank you! I know you've already found the new ones, I hope they are as good as these old ones! They are perfect for sure. ...non ho mai provato smalti di questo brand, alcuni sono spettacolari...volevo vederli al cosmoprof ma ero di fretta e girando non ho trovato lo stand!!! Gimme gimme gimme gimme gimme gimme! It's so beautiful! Probably not my overall favourite from the Halo Hues but all of them are gorgeous honestly! How gorgeous! I don't own it but I wish I did! The Halo Hues Collections ate some of my favorite mainstream polishes! Oh my, that is incredible! That holo flame is all sorts of beautiful! this shade is on my wishlist for sure! 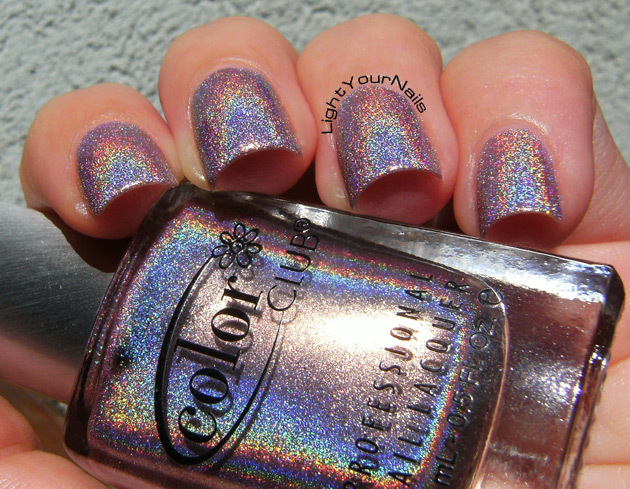 All that holo sparkle is freaking drop dead gorgeous! I am drooling! The Halo Hues still look to me to be the best holos out there yet I don't own a single ONE!!!! Nope! This one is gorgeous on you!! You gotta get them Dani!